Last night, I played the first episode of Heidi, Girl of the Alps. It was the first time I had watched for a couple years, and this is one of my all-time favorite Isao Takahata classics. 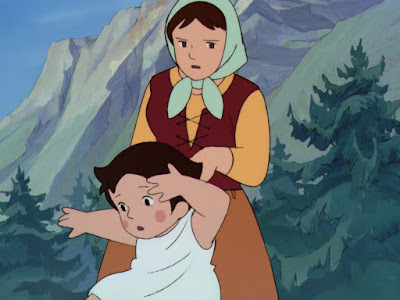 Like many of you, I am far too upset and heartbroken to even think about watching something like Grave of the Fireflies or The Tale of the Princess Kaguya. Let's just play in Heidi's happy world for now. Episode 1 is absolutely fantastic and packed with boundless energy and an amazing assortment of compositions, layouts, and art designs. And there are more than a few genuine comic moments. Here is one such example. 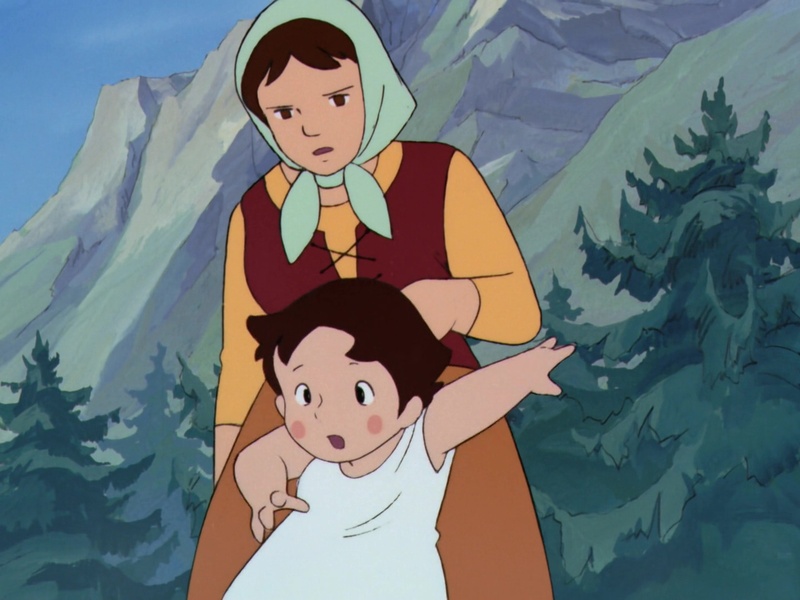 It's a brief shot where Heidi sees Peter the shepherd boy sprinting down the mountain, and she wants to charge after him. Notice her wind-up pose, which is a wonderfully funny cartoon pose. Heidi begins to dart forward, arms outstretched. The aunt suddenly sees this, and with a very subtle movement, grabs Heidi by the back of her shirt, pulling her back. 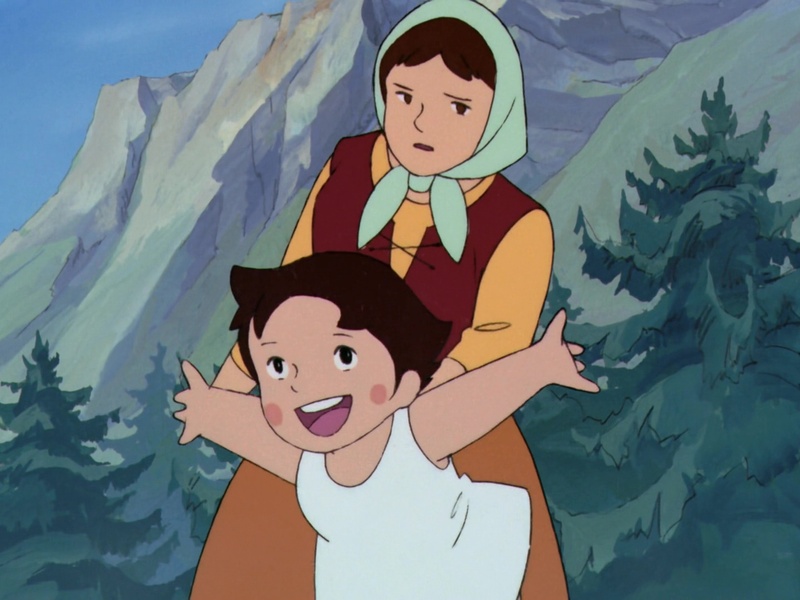 Heidi's reaction poses are terrific, as she is literally yanked back into place with a baffled look on her face. Note how Heidi gets all the action in this cut. She gets the dynamic poses and the classic cartoon movements that are only very slightly exaggerated. The aunt, meanwhile, is animated in a "realist" manner, with little movement, a tilt from left to right. Note, also, how Heidi darts into the picture frame at an angle. This episode is packed full of these three-dimensional compositions, as characters move at varying diagonal angles, many times brushing right up against the "camera." This was a technique that Takahata obsessed about in Horus, Prince of the Sun, and now he takes that to the next level. Heidi, Girl of the Alps is grounded very firmly in realism, with a strong emphasis on documentary details of daily life and complex character melodrama. These elements are also balanced by classic cartoon gags and poses. It's much more restrained than, say, Lupin the 3rd, which can veer from James Bond to Road Runner at the drop of a hat. Isao Takahata, Hayao Miyazaki and Yoichi Kotabe succeed in finding just the right balance for Heidi. 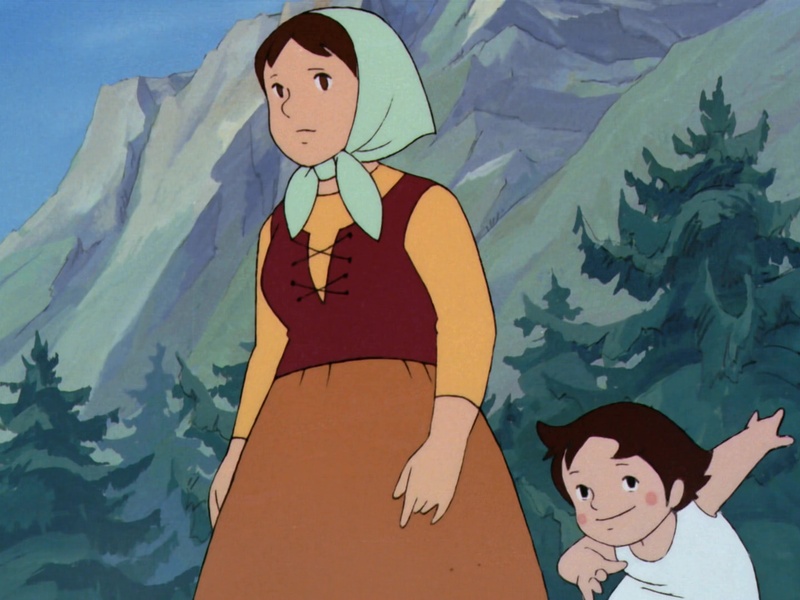 Compare Heidi episode 1 to any American cartoon show from the same era. The difference in visual technique is absolutely staggering. Hanna-Barbara and Filmmation are great, but they're stuck very firmly in a 2D world. Paku-san is obsessed with moving in a fully 3D world, mimicking the look of classic cinema as much as humanly possible. Today, this sort of thinking is commonplace and nobody bats an eye. But in 1974, just as in 1968, this was radical and revolutionary. Nothing like this had ever been seen before. What a magnificent series. I feel like I could write a book just about this one episode. Heck, maybe I ought to try? Any takers on that? Anybody interested? Bueller?